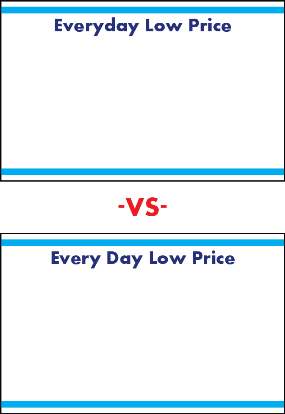 A grocer may print information pertaining to a low price deal, on the above pictured sign, and attach it to a shelf for customers to see. In marketing, the benefit of "everyday low price" is that in THAT store, the customer does not need to wait for a sale, miss a sales price because of not being a member of the "customer loyalty" program, etc., so the sign that reads "Everyday Low Price" is correct in this context. It is not appropriate in the sign in the question. "Low prices every day" might attract customers. The adjective EVERY modifies the noun DAY. The phrase EVERYDAY means daily happenings or occurrence of something. Depending in the context it is being used, it could also be used adverbially. Everyday together is more correct, to space it out is to make it two words. Not the answer you're looking for? Browse other questions tagged orthography phrasal-adjectives or ask your own question. Which is correct, “cill” or “sill”? Which is the correct orthography? Correct spelling of Chinese name in English? Why is “Rectangled” not accepted usage?